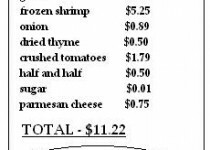 boy, do i love shrimp. my favorite way to eat shrimp is at a japanese steakhouse. my absolute FAVORITE restaurant. but i do not like the cost of it or eating out! i have created ways to make shrimp dishes when i find it on sale and this is one of them. 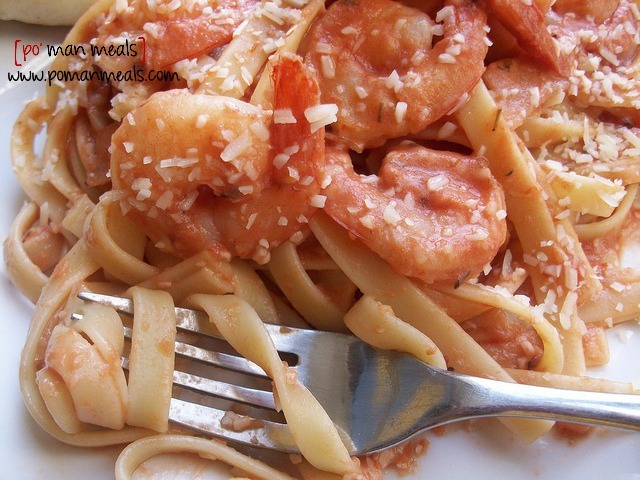 a great way to stretch the price of shrimp is to add it to pasta! this sauce would also be great with any other protein or veggie. in a large pot, bring water to a boil. add fettuccine and cook according to package instructions. drain and set aside. preheat the large skillet. once hot add the oil and butter. add the garlic, onion, thyme and salt/pepper to taste; saute until garlic is fragrant and onions are slightly tender. add the shrimp, salt/pepper to taste and saute until pink. add the crushed tomatoes, half & half and sugar. let simmer until slightly thickened. add the parmesan cheese and reserved fettuccine noodles. toss well and serve with parmesan sprinkled on top.